Friends, I don’t know how we got here so quickly, but we did. 2016 is nearly finished. Can we all agree it was a doozy? Let’s raise a glass to reining in the new year with a million possibilities ahead. I have the perfect drink for such an occasion. This cocktail is inspired by a mimosa served at one of our favorite brunch spots in Portland – Besaw’s. We love Sunday brunching, largely for the booze. This isn’t your average mimosa though. 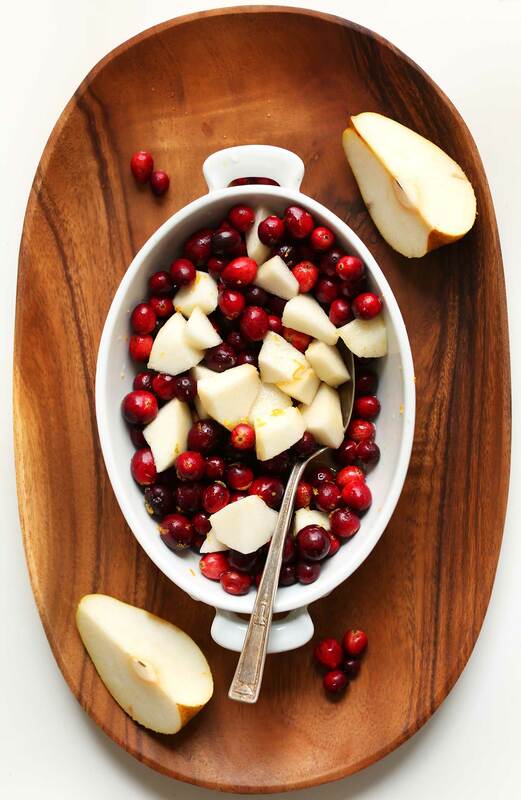 In place of traditional orange juice, we make a reduction/puree of cranberries, orange zest, and pears. Mmm. 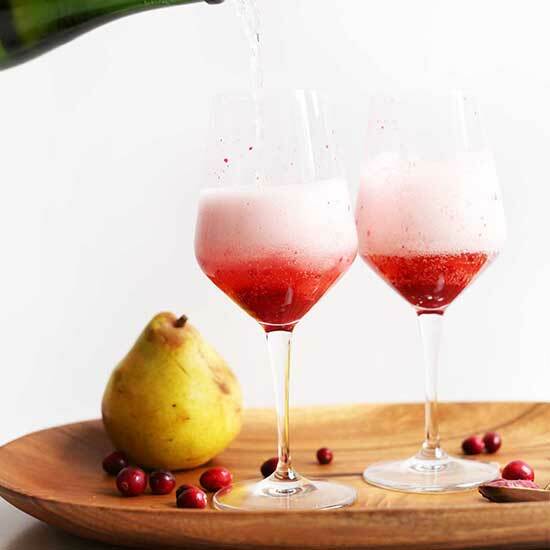 The result is a perfectly tart-sweet cocktail that’s ideal for brunching and such occasions as New Year’s Eve. The major perk? It’s naturally sweetened and requires just 5 ingredients. Cheers to that. This would make the perfect NYE cocktail for any parties you’re hosting or attending. They’re so delicious it’s dangerous – watch out. Just one won’t do. 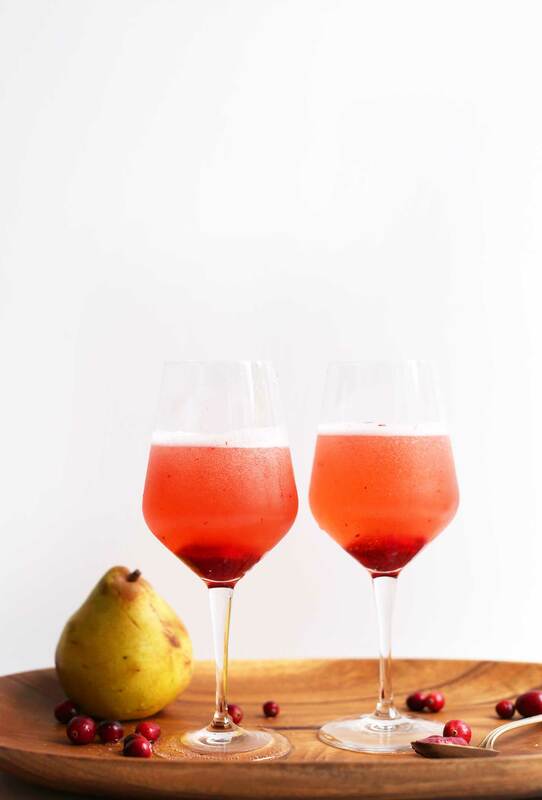 If you’re looking for more NYE cocktail ideas, check out our Easy Traditional Red Sangria, Pomegranate St. Germaine Spritzers, Grapefruit Lime Spritzers, Apple Cider Rooibos Hot Toddy, Chili Cinnamon Bourbon Hot Toddy, Ginger Beer Margaritas, or our Winter Bourbon Smash. And for a trip down memory lane and to hear how this blog came to be, including our toast to 2013 (!! ), check out our Pomegranate Lime Spritzers. If you try this recipe, let us know! Leave a comment, rate it, and don’t forget to tag a photo #minimalistbaker on Instagram. We’d love to see what you come up with. Literal cheers, friends! 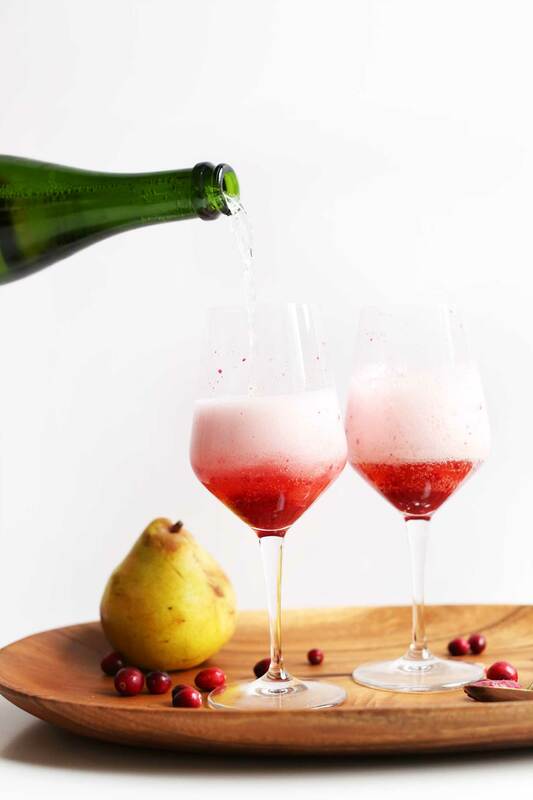 Fancy, 5-ingredient champagne cocktails with pear-cranberry reduction. The perfect festive drink for New Year's Eve and special occasions this winter. To prepare fruit compote/reduction, preheat oven to 400 degrees F (204 C) and add cranberries, pear, orange zest, water, and maple syrup to small baking dish. Toss to combine. Bake for 20-22 minutes or until the fruit is bubbly and most of the cranberries have burst. 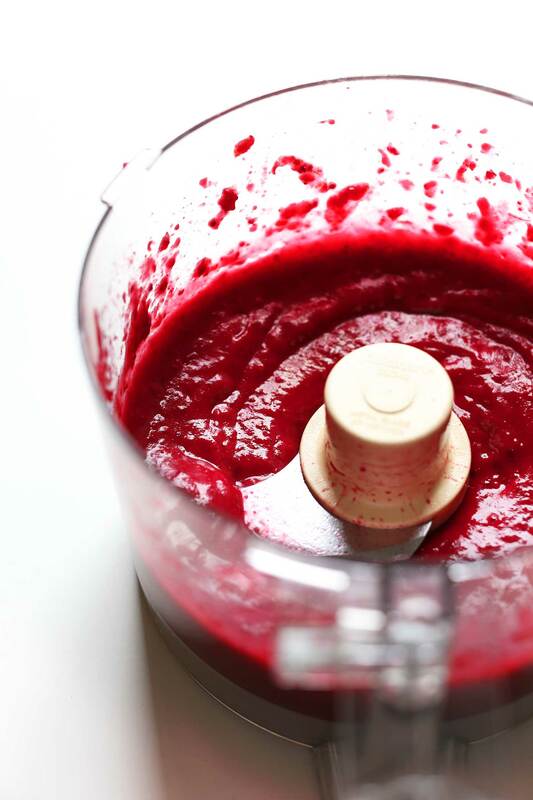 Transfer mixture to a food processor or small blender and blend/mix on high until a compote consistency is reached. If needed, add more water to thin (see photo). Taste and adjust flavor as needed, adding more orange zest for citrusy flavor or maple syrup for sweetness (I added a little more of both). To remove any residual pulp and give the puree a smoother texture, work through a fine mesh strainer/sieve and into a serving container/jar. This is an optional step that makes the cocktail easier to mix. Transfer the compote to the refrigerator to chill - about 30 minutes to 1 hour or until cool to the touch. To serve, add about 2 Tbsp of the compote into each serving glass (champagne flutes are ideal). Top with a bit of champagne. Then use a spoon or stirrer to blend the two together. This will help the fruit mix with the champagne more seamlessly. Top with more champagne until the flutes or glasses are 3/4 full. Enjoy immediately! You will likely have leftover compote, which will keep for 1-2 weeks in the refrigerator. *Nutrition information is a rough estimate calculated with the entire bottle of champagne and about 3/4 of the fruit puree. ← 5-Minute Detox Salad with No-Mix Dressing! Cannot find fresh cranberries here where I live. Could I replace them with cherries for example? Hi Nuria! We haven’t tried it, but it should work! Keep in mind that it will have a different flavor and will most likely be sweeter! This looks delicious! I think I will surprise my husband with it later this week! What do you think about using a riesling instead of champagne? Hi! I haven’t tried it but imagine that it would be just as tasty! Let me know how it goes! I made this for New Years last night! It was awesome! I did make a change to 1.5 cups frozen mixed berries bc I had them on hand but everything else was the same. Definitely needed the straining due to the seeds ! We also served it in our gin and tonics and was a hit! Made this tonight and was delicious! I put through the strainer, but I think it would be just as good without that step. This is my kind of drink for the New Year. Thank you for this one and happy new year. I love the sweet-tart flavor combo in this!! I get so frustrated with sickeningly sweet cocktails or ones with so much alcohol they belong at a frat party. This looks like a perfectly elegant version. I have everything I need for this but cranberries … I wonder if I could use dried? Hmm, I don’t know if that would work as well. I think fresh or frozen is best! I made the cranberry sauce that went with the Mushroom Lentil Balls for Christmas. I have some left over. Very similar to this except for the pinch of salt (which I can’t remember if I even put in) and minus the orange zest. I might strain a little and see if it will work. Love Love Love the Mushroom Lentil Balls by the way. That whole meal was very good. Love, love, LOVE all the NYE drinks which are popping out around the blogosphere the last days :) Here’s for 2017! Hi! I haven’t tried that substitution but think it should work out nicely! If you try it out, let me know how it goes! That’s what I’m doing! I’m just not adding as much maple sugar so it’s not too sweet. Happy New Year!! This looks tasty! Personally, 2016 didn’t finish well, but I am hopeful for 2017! This is my kind of mimosa. I can absolutely raise a glass to 2016 being over- here’s to the new! Couldn’t tell you where 2016 went but overall, it was a good year for us and I’m a little sad to see it go to be honest. So I guess a naturally sweetened drink should help usher in the New Year and all the 2017 will bring. Hopefully peanut butter balls.